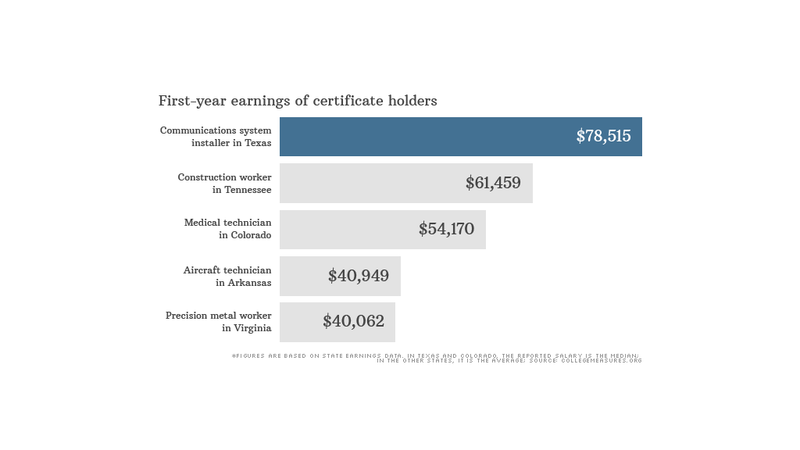 In Texas, those who graduated from certificate programs to become communications systems installers, earned an average of $78,515 their first year on the job. Shelling out more money for a four-year college degree doesn't always mean you'll land a job with a better salary, a recent report found. In fact, graduates of many two-year associates and occupational certificate programs earn just as much as workers with traditional four-year degrees -- if not more in some cases, according to a report from CollegeMeasures.org, which analyzed the earnings of recent graduates in Arkansas, Colorado, Tennessee, Texas and Virginia. In Texas, for example, workers with "technical" associates degrees, which typically include specialized training in fields such as technology and healthcare, earned a median annual salary of $50,827 in their first year after graduation -- an average of $11,000 more than those with bachelor degrees. In Arkansas, aircraft technicians with an occupational certificate earned, on average, more than $40,000 in the first year on the job, while college graduates with a psychology degree earned roughly $26,000. Over the span of a career, however, the earnings potential shifts with the average four-year college graduate out-earning the average associate's degree holder, said Mark Schneider, president of College Measures. But the four-year degree often comes with a hefty price tag. For the 2012-13 school year, average annual tuition and fees at public four-year colleges was $8,655 and nearly $30,000 at private institutions, according to the College Board. At public two-year colleges (mainly community colleges), the average annual bill was $3,131. With college costs spiking, student debt at record levels and hiring still weak, Schneider said it's essential that incoming students take into account their future earnings and job prospects when choosing a school and area of study. For example, workers with "academic" associates degrees, which are tailored to students hoping to transfer to four-year schools, typically earn far less than students who choose technical and occupational associates degrees where students are armed with much more specific vocational skills. "Students who go into community colleges with the expectation that they're going to transfer to a four-year degree are not getting their money's worth quite frankly," said Schneider, noting that many students never make it to the four-year degree. According to the report, biology and chemistry majors have starting salaries that pale in comparison to their other STEM counterparts. In Virginia, for example, graduates with a bachelor's degree in engineering earned an average starting salary of more than $50,000, while biology grads earned less than $30,000. Schneider said he is hopeful that more students will educate themselves before taking on significant student debt to finance their education. President Obama recently proposed rating colleges on a variety of factors, including the earnings of its graduates. "Right choices can lead to good careers and high earnings, but wrong ones can leave graduates with mountains of debt and poor prospects of ever paying off their student loans," he wrote.